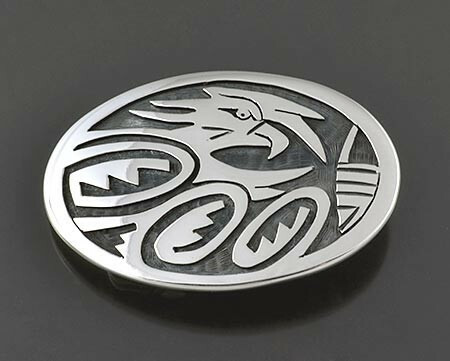 Sterling silver overlay belt buckle by Fermin Hawee (Hopi) Fermin Hawee is a member of the Rabbit Tobacco Clan and has been active silversmithing since 1991. He studied at the Hopi Silvercraft Guild Cooperative and also with his father, Billy Rae Hawee. His hallmark is a rabbit track. 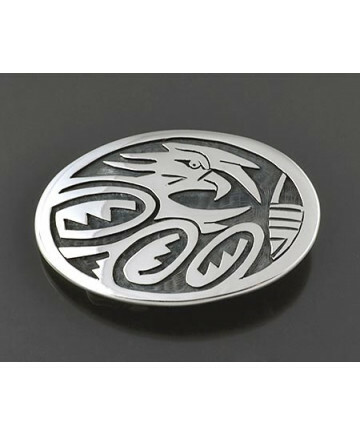 This belt buckle measures 2 inches by 1 1/4 inches and fits a belt width of 3/4 inch.